Key initiatives to support early-career researchers and open science are nearing completion. As we near the end of this year’s Ambassador programme, several projects are shaping up for public release. This includes a centralised resource of funding opportunities for early-career researchers, research into best funding practices for diversity and a toolkit for involving members of the public in research. To aid the success of their projects, the Ambassadors are issuing final calls for wider feedback and input into their activities. ECRcentral is about to become a website all about funding opportunities for early-stage scientists. It started off as a collation of information gathered in spreadsheets curated by Juan Quintana (Wellcome Centre for Anti-Infectives Research, UK), Lotte de Winde (eLife Early-Career Advisory Group (ECAG), MRC Laboratory for Molecular Cell Biology, UK) and Cristiana Cruceanu (Max Planck Institute of Psychiatry, Germany), with filtering functions allowing users to quickly browse through options relevant in a number of common circumstances. 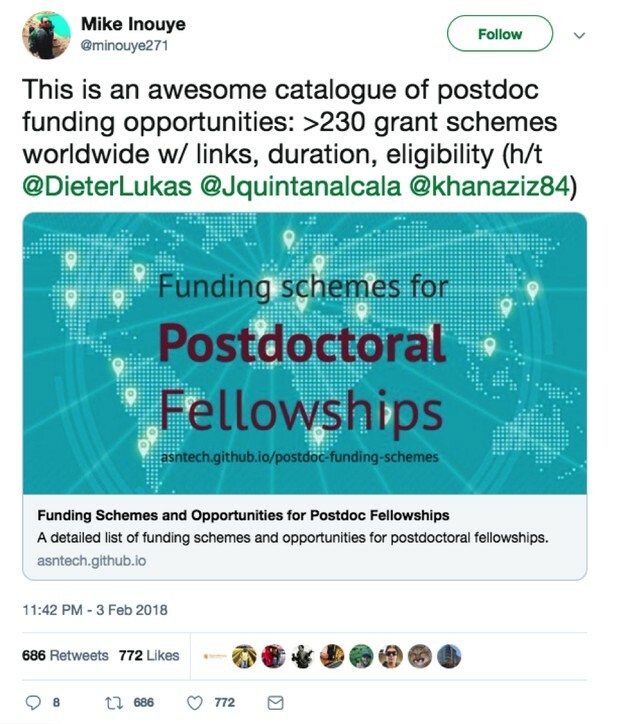 Aziz Khan (University of Oslo, Norway) is now developing that table, which has been a hit on Twitter since day one, into a central platform with improved searchability, example funding applications and a discussion forum to help candidates exchange experiences and tips about the application processes. Whilst ECRcentral is improving access to information about funding, another group of Ambassadors is concerned with equal access to funding opportunities for researchers of diverse backgrounds. In the opinion of eLife Ambassadors, the eligibility criteria and even the design of the applications process of many offered fellowships are not sensitive enough to the realities of the circumstances of early-stage scientists. David Eccles (Malaghan Institute of Medical Research, New Zealand), Elisa Floriddia (Karolinska Institutet, Sweden), Tai-Ying Lee (University of Oxford, UK), Carmen Lia Murall (CNRS, Montpellier, France), Freyja Olafsdottir (University College London, UK), Uschi Symmons (University of Pennsylvania, USA) and Lotte de Winde are completing research into fair funding practices. Currently they are soliciting feedback from funders who implement fair practices, to understand better what convinced these organisations to employ such policies. They’re also polling ECRs about their experience of taking parental leave. Their aim is to make the funding landscape a more friendly one for early-stage scientists from diverse backgrounds. Within the next few weeks, the group is aiming to publish a blog post to help early-career researchers understand different fair policies that they may want to look out for when applying for grants for their work. Moreover, they are drafting a white paper to bring such policies and their benefits to the attention of funding agencies, to advocate for the wider adoption of fairer, more inclusive policies by funders of science. The reproducibility workshops involve a number of volunteers outside of the programme, as well as eLife Ambassadors. Following the successful launch of the workshop at the Plant Biology 2018 meeting in July, the Ambassadors busied themselves with rethinking the format to make it adaptable to audiences with diverse foci. Benjamin Schwessinger (Australian National University, Australia), Tracey Weissgerber (QUEST Center, Berlin), Helena Jambor (Technische Universität Dresden, Germany), Bradley Alicea (Orthogonal Research Laboratory, OpenWorm Foundation, USA), Peter Crisp (The University of Minnesota, USA), Diep Ganguly (Australian National University, Australia) and Sarvenaz Sarabipour (Johns Hopkins University, USA) decided to cut the original presentation content into modules, and add new content relevant to specific audiences. The speakers are now recording webinar-style training videos for future trainers. Tuan Tran (Nanyang Technological University, Singapore) also suggested developing a collection of science-style posters, which the Ambassadors can pick and choose from to raise awareness of specific reproducibility tools and practices in their institutions. The group would like to see all these materials hosted on a dedicated website as a conclusion of this year’s project, and Bradley Alicea is on the task to make it happen. A project was proposed initially as a learning-by-doing initiative, guided by the members of the team. Tracey Weissgerber, Helena Jambor, Sarvenaz Sarabipour, Erin Wissink (Cornell University, USA), Ahmet Bakirbas (University of Massachusetts, USA), Vivek Bhardwaj (Max Planck Institute of Immunobiology and Epigenetics, Germany), Bradley Alicea, Luke Hoepnner (University of Minnesota, USA), Steven Burgess (University of Illinois, USA) and Vinodh Ilangovan (Max Planck Institute for Biophysical Chemistry, Germany) conducted a collaborative investigation into transparency of reporting for scientific images. The team has already screened and identified eligible articles in top physiology, cell biology and plant sciences journals. Currently they’re abstracting data on relevant images, using the tools also developed by the team, and drafting the article. On completion, they aim to publish their research together. At the end of the summer, Sarvenaz Sarabipour​​, Erin Wissink​, Steven Burgess​​, Zach Hensel (ITQB NOVA, Portugal), Humberto Debat (National Institute of Agricultural Technology, Argentina), Edward Emmott (Northeastern University, USA), Alper Akay (Wellcome CRUK Gurdon Institute, USA), Kadir Akdemir (University of Texas MD Anderson Cancer Center, USA), and Benjamin Schwessinger wrote an article postulating that preprints support effective dissemination of the latest science for the benefit of the scientific community, as well as the public at large. In their publication, the group calls for a closer dialogue between journalists and scientists when it comes to informing the public about the latest discoveries. Daniela Saderi (Oregon Health & Science University, USA), Sam Hindle (bioRxiv, USA) and Steven Burgess of the PREreview team were very busy applying for new funding to improve their platform and running workshops and talks at a number of meetings in the recent months. They also ran online livestreamed preprint journal clubs in partnership with PLOS during MozFest to mark Open Access Week 2018. The group is now preparing for the launch a new peer review mentorship programme in 2019. All these initiatives are meant to help researchers not only learn about preprints, but also engage them in first-hand experience of using preprints, so they see for themselves how useful a resource they are. Emma Dorris (University College Dublin, Ireland), John Burns (American Museum of Natural History, USA), Erin Wissink, Vinodh Ilangovan, and Hannah Wang (Institute of Cancer Research, UK) aim to create practical, universal resources to help include non-scientists in the process of conducting research. Whether through citizen-science or patient involvement initiatives, members of the public can be actual contributors to research in many ways, including by gathering data, or engaging in a two-way talk with researchers. The team is gathering responses about the wider awareness, implementation and gaps in resources for scientists in this area with a dedicated questionnaire. They invite all life scientists, whether interested in involving public in their research or not, to share their perspectives. Groups interested in these subjects have been amassing relevant resources for a number of months. Following a series of blog posts about interview preparations, recently Luciane Tsukamoto Kagohara (Johns Hopkins University, USA), Sarvenaz Sarabipour, Uschi Symmons, Zach Hensel, Erin Wissink, Aparna Shah (Johns Hopkins University, USA) and Savio Chan (Northwestern University, USA) have been working on tips for graduate/postdoctoral lab choice, mentoring guidelines for mentors and mentees, and practical models for lab manuals. The latest initiative was launched at the start of October, led by a team that include three eLife Ambassadors: Yaw Bediako (KEMRI-Wellcome Trust Research Program, Kenya), Cheryl Che (Pwani University in Kilifi, Kenya) and George Githinji (KEMRI-Wellcome Trust Research Programme, Kenya), as well as three volunteers outside the programme. The African Science Initiative is a networking platform targeting young African scientists around the globe. They aim to foster greater collaboration and improve mentorship. The initiative also serves to assemble a critical mass of young scientists for science advocacy in Africa. The site already has 90 registered members based in 18 different countries on five continents! Follow them on Twitter: @AfricanScI. 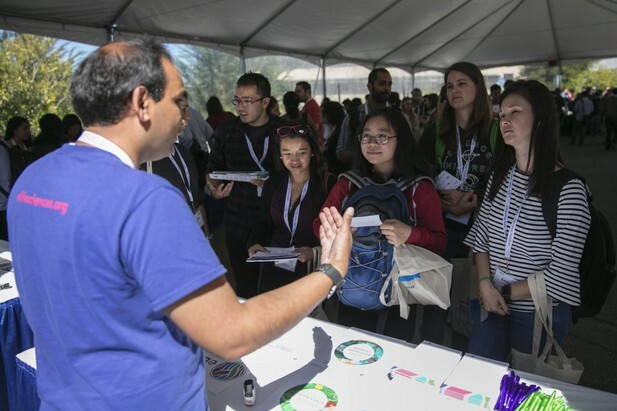 Before the end of 2018, Lipi Thukral (Institute of Genomics and Integrative Biology, India), Sofia Araújo (University of Barcelona, Spain) and Babak Momeni (eLife ECAG, Boston College, USA) are hoping to organize a one-day Twitter event to prompt conversations about diversity in science. Templated tweets will support sharing experiences and views on the matter. With eLife’s support, the Ambassadors organise workshops on matters relevant to their involvement in the programme. Many such events took place in October. Starting the series was the National Postdoc Symposium organised by Venkatakrishnan Ramaswamy (National Centre for Biological Sciences, India) and local volunteers, which took place at the Centre for Cellular and Molecular Biology in Hyderabad, India. The event aimed to highlight top research conducted by early-career scientists working in India, and to discuss skills and opportunities for building a thriving scientific career in the country. Soon after, Uschi Symmons organised a pre-conference workshop on science communications and peer review at 3rd FEBS Danube Conference on Epigenetics in Budapest, Hungary, with the involvement of eLife Reviewing Editor Beate Lichtenberger (Medical University of Vienna, Austria). Elisa Floriddia has also co-organised this year’s Careers Inside Academia event at the Karolinska Institutet, Sweden. The event focuses on essential skills for scientific career development, and this year the theme was ‘How do postdocs make the leap?’. The meeting included a panel discussion of speakers involved in the recruitment and funding of junior scientists and researchers, providing pointers on the key features they look for when assessing candidates. At the end of the month, Pablo Sáez (Institut Curie, France) organised a Science Career Day at the Institut Curie for Postdocs and PhD candidates. Editorial life, preprints, as well as improvements in publishing and incentives system in science were hotly debated during the event. Jason Fernandes, eLife Ambassador at University of California, Santa Cruz, USA, talking about eLife’s initiatives for early-career researchers at San Francisco Bay Area Postdocs Symposium. Photo courtesy of Berkeley Labs. As the initiatives and ideas develop, the dedicated ecrLife blog grows with great content. Launched by Steven Burgess, the blog is now managed by new ECAG member Devang Mehta. In the last quarter it has seen the launch of a new interview series. It also hosted two blog posts on ‘What reviewers think’, based on interviews with editors at eLife and other journals. This mini-series celebrated Peer Review Week. ecrlife.org is an important resource for anyone interested in following the progress of the Ambassadors initiatives more closely.